Kristen has been my friend ever since we moved to her town back in 1992. She's been getting up at 4am to write in peace and quiet for the last many years and finally an agent recognized her work! I'm sad to say she sent me this book early this summer and with the state of my life lately I just finished it last week. Sorry Kristen! All that to say, it was quite amusing to read this book knowing her so well. I'm pretty sure it was semi-autobiographical and the dog scenes are very much true to life! I actually had to look up Cozenage and in this sense I think it means to be deceived. Probably should have looked that up before I read the story, but it all made sense in the end! So without further ado, my friend's first published novel! 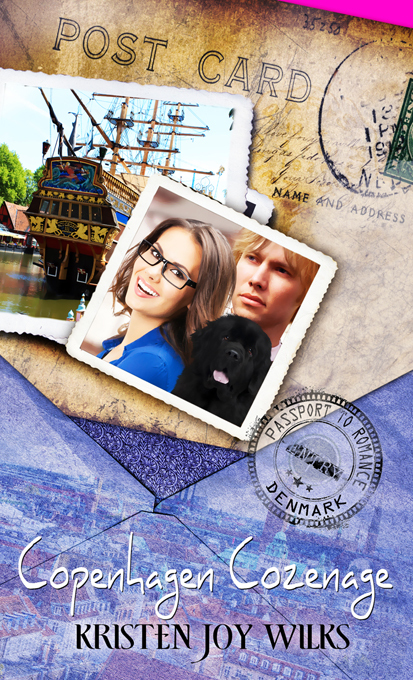 Morgan Ravn arrives in Denmark seeking clues about her mysterious heritage. What she finds is a flirtatious stranger who regales her with a story about a jewel thief from 1958 and then abandons her with a large unruly dog. Can Morgan locate the irresponsible pet owner before his monstrous canine drags her through every puddle in Copenhagen and sheds all over her last dress? And why are strangers dogging her every step, snapping photos? Is the shutter happy behavior a bizarre Danish custom or something more sinister? I wasn't quite sure what to think of this book in the beginning. I think it reads a little bit like a Robin Jones Gunn Christy Miller story in the timing and story development. Those were the young adult novels of our generation! About halfway through I actually realized that it was a mystery novel though and it got quite interesting. It ended quite satisfactorily and not how I expected at all and I totally loved that there was an epilogue! Copenhagen Cozenage is currently on sale through Pelican Book Group and can also be found on Amazon and other book stores. This is an e-book only. Kristen Joy Wilks is the wife of a Camp Director and board game enthusiast, the mother of three fierce boys, and the owner of a Newfoundland. She has learned many things from living at a remote mountain meadow with her family. Including but not limited to: Spiders are endearing pets that must be named and coddled and gazed at with rapturous affection, Risk is a “total dice fest” and must never be included in a true gamers collection, and when you reach for your floss and it is wet, there is a good chance that a loving family member has washed it for you. But be cautious, for the sink and tub are not the only water producing fixtures in the bathroom. She once took her 120 lb puppy on a walk and the fact that she was 5 months pregnant did not keep him from yanking her off her feet and dragging her forcefully across the lawn when he spotted the water. But she is grateful. Her many adventures with the aforementioned puppy, her practical joking husband and overly imaginative sons have provided a plethora of story ideas. Kristen is a member of ACFW, a semi-finalist in the Genesis contest, and a contributor to Nature Friend magazine and Focus on the Family’s Thriving Family Magazine. Her story Day of the Cyclones is included in Nancy Kennedy’s book Miracles and Moments of Grace: Inspiring Stories from Mothers, and Pelican Book Group is publishing her debut novella, Copenhagen Cozenage, in September of 2015 and Athens Ambuscade in 2016. Kristen provided me with a free copy of her novel to facilitate my review. Yay! You read it, I'm glad you enjoyed. Thanks so much Krista-Lynn.